As for C168, I would measure the resistance between ground and each of the pins of a single NAND. Then consult the NAND pinout and determine which, if any, of the grounded pins is not actually a power ground. ISTM that your NAND array must be powered from both the 3.3V and 1.8V supplies. The Vcc supply (3.3V) would power the logic and the NAND cells, while the VccQ (1.8V) supply would power the I/O section. Capacitor C168 would provide local bypassing of the VccQ supply for all NANDs. However, if the NAND chips follow the ONFI 2.2 spec, then we would expect that pins 34 and 39 would be connected together. That said, your latest measurements would suggest that C168 is no longer shorted. Are you certain that your original measurement was correct? Yes i'm sure that pin 34 and 39 are not connected together. Sorry, I can't understand the function of C168, nor can I suggest a suitable replacement. It might be interesting to see if the short persists after removing the capacitor. Does anybody of you know how to JTAG this SSD so that i will be able to see terminal log? I can't tell if C145 is populated. If not then JTAG probably disabled by removed components, probably some resistors elsewhere. Then JTAG might be disabled in the system as well. Usually companies like Sandforce don't leave JTAG open at the front door. JTAG and Terminal log are 2 separate things. Terminal Log is from the serial port. I would be interested to see just what is available on the JTAG Port though. RDT stands for a number of things.. one is "Remote Distributed Testing" and Sandisk would have some software custom for this. which could be more likely. I have a JTAGulator which would be very good for quickly figuring out the layout/operability of the JTAG port. Could you please post pictures of the front and back of case so I can try and buy the same SSD and do some testing? Hi HaQue, thank you for your help. C145 is populated, C145 tracks are connected to a NAND chip. "Just back up your data and there is no problem"
The whole existence of this forum pretty much assumes this advice has already been ignored. While a philosophical look at encryption might be interesting, it does not in any way address recovering DATA from these devices.. which is what we are trying to do. Another point, suppose you did have the Key? then what? has anyone figured out steps to use a key to recover customer DATA? There are problems that can be fixed to recover DATA such as electrical issues. While I don't disagree with you, I think your post doesn't address the issues of OP and others with similar cases, and is a little off topic. Have you finally solved the ssd repair? Because I have an identical ssd, dead , and I'm sure it can be brought to life somehow. @alindumitru46, can you provide better photos of both sides of the PCB? These are the best pictures I can make. The short story: I purchased 4 Sandisk X100 SSD with a "strange" SMART issue 5 years ago . Only 1 died, after 1 month, the others 3 pcs run fine with max performances in 2 laptops and 1 NUC. After running for about 1 month, the next day he was not recognized in the BIOS, then by any motherboard I checked. Can use MHDD or Victoria. 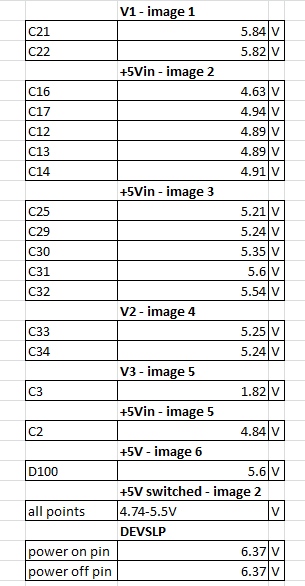 Can you measure the voltages at V1, V2 and V3? I just finished measuring the voltages at those points, according to the scheme, using a no-name PSU and a UNI-T UT139B digital multimeter. Most of those voltages don't make sense. Are you using an appropriate PCB ground reference?? Does your meter have a weak battery? ?